ST. PETERSBURG, Fla. -- Duke Energy crews and contractors are working 16-hour days and overnight hours to restore power to Florida customers and responding to 911 assistance calls in the aftermath of Hurricane Matthew. The massive Category 4 storm's damage was felt from Florida's Atlantic Coast all the way across Central Florida. More than 233,000 customers have been restored in less than 48 hours since the storm exited the company's service territory. As of noon, approximately 47,500 customers were without electricity. The vast majority of those are in Volusia County. More than 80 percent of the company's customers impacted by the storm have been restored. Although many will be restored earlier, the goal is to have all customers impacted by the storm, who can receive power, restored before midnight tonight (Sunday). Restoration in the most severely impacted areas of Volusia County may continue into Monday. "More than 3,500 crews, contractors and support workers continue to work around-the-clock to restore power and respond to emergency assistance calls since the storm passed. 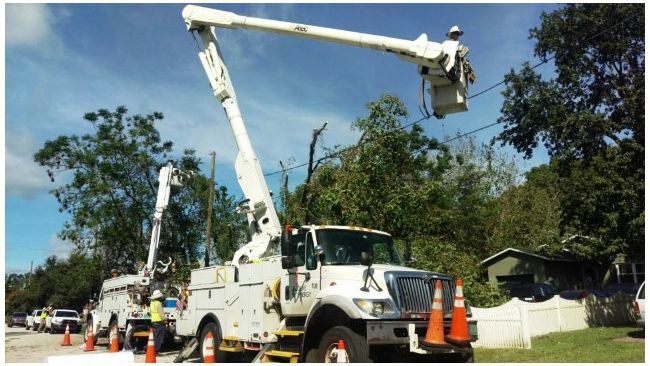 We've brought in additional resources to get customers back to normal as safely and quickly as possible," said Luis Ordaz, Duke Energy Florida storm director. "We appreciate the patience of our customers while we work through the storm damage." Crews will continue to work on scattered and isolated outages until all service is restored. Occasionally, service may be delayed for customers where a meter or other customer equipment is damaged and requires repair and inspection. As crews respond to make repairs and restore service, specific estimated times of restoration will be updated for customers. Customers are encouraged to sign up for text message updates (text REG to 57801) or call the Customer Care Center at 800.700.8744 for individual restoration times, as they become available. The peak number of outages was at 2 p.m. on Friday, Oct. 7, with 165,000 customers without power as the storm crawled up the Florida coast. Duke Energy Florida has invested more than $2.4 billion since 2004 maintaining and strengthening its energy system. These investments include trimming trees, replacing wood transmission structures with steel or concrete and installing grid automation and Smart Grid devices which help to improve service reliability and reduce both the length and number of outages.